Watching the opening night match-up between the Celtics and 76ers last night there was only one thing that kept running through my head, Ben Simmons is special. Simmons started his season great with a 19 point, 15 rebound, 8 assist, 4 steal and 2 block performance, albeit in a 76ers loss. He wowed with his quickness and ability to push the pace, he was unstoppable on the glass and seemed to have eyes in the back of his head with his ability to find teammates all over the court. He looks like the closest thing we have seen to a young Magic Johnson. They both are 6’9″ point guards with once in a generation ability to lead a fast break and put their teammates in favorable positions to score and they do so with flash and substance. Neither Magic or a young Simmons was able to shoot the deep ball as well (Simmons doesn’t even try). Magic dealt with an injury prone second season in the league as Simmons dealt with his first season, but as Magic started to develop he became an even more lethal rebounder and passer and established himself as a MVP candidate on a yearly basis, something Simmons could do as early as this season. 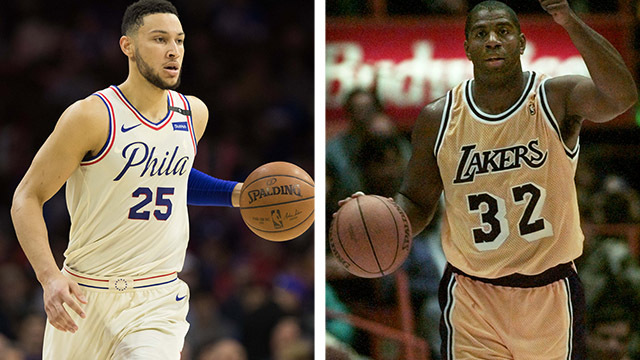 If Ben Simmons were ever to develop a jump shot he may become the most dangerous force in the league, but Magic is proof that he doesn’t need to in order to be an elite talent in the league for the next 10 to 15 years. We have a lot of special young talents in this league with the Greek Freak, Donovan Mitchell, Devin Booker, Kristaps Porzingis, Joel Embiid, etc. but Simmons is as special as any of them.